Selling the public Postal Service to private corporations is not in the public interest and would be nothing more than a raid by corporate pirates on our treasured public Postal Service. On June 21, 2018, the White House’s Office of Management and Budget (OMB) released a restructuring proposal for the federal government. The proposal, “Delivering Government Solutions in the 21st Century,” delivered misinformation without ever consulting the United States Postal Service (USPS) and, if implemented, would end regular mail and package services at one affordable price, delivered to all 157 million addresses six days a week – regardless of geographic location. The OMB proposal takes direct aim at the USPS under the guise of reforming and structuring for the 21st century. Selling the public Postal Service to private corporations is not in the public interest. The White House’s plan states, “Like many European nations the United States could privatize its postal operator.” What’s left unsaid is European nations charge substantially more for mail services delivered in a much smaller area, and they regularly raise the price of delivery. One example is that the price of sending a letter in the United Kingdom has increased 80 percent over the last decade. Eliminating the universal service obligation to deliver to the 157 million U.S. addresses at the same price, as the plan suggests, would hurt businesses and individuals alike. It would be a dagger in the heart of rural America and undermine e-commerce. 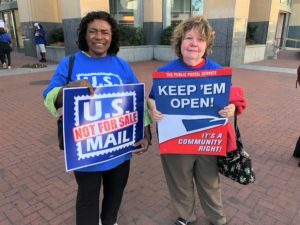 The White House USPS Task Force Report, released on Dec. 4, outlines the first step of the OMB’s privatization proposal – restructuring the USPS to fatten it up for sale. Join us in stopping this threat!